In a letter Tuesday addressed to Facebook CEO Mark Zuckerberg and Twitter CEO Jack Dorsey, Democrats Dianne Feinstein, the vice chair of the Senate Intelligence Committee, and Adam Schiff, the ranking member of the House Permanent Select Committee on Intelligence, demanded that the companies hand over information on accounts spreading the hashtag #ReleaseTheMemo. Coming just days after Twitter emailed hundreds of thousands of users warning them that they had liked, shared, or followed “Russian propaganda,” the letter is another step in the efforts by the Democratic Party, working with the major social media companies, to paint all social and political conflict in the United States as a product of Russian interference. The Democrats’ demands center around a letter authored by Republican Representative Devin Nunes, which alleges that the FBI carried out a FISA warrantless wiretap of the Trump campaign, possibly including Trump himself. While Trump has claimed that “Obama had my ‘wires tapped’ in Trump Tower,” Democrats have insisted that no such wiretap occurred. In recent days, right-wing media figures, including the pundit Sean Hannity, and Republican members of congress have initiated a campaign to release the memo as part of the deepening factional conflict within the ruling elite over the allegation that Trump “colluded” with Russia. 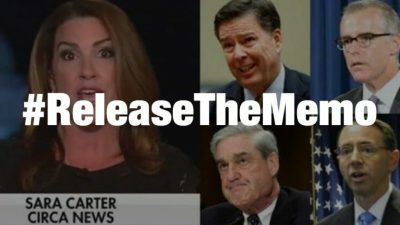 Whatever the source of the #ReleaseTheMemo campaign, Twitter and Facebook users have the right to read social media messages and express their opinion without fear that their information will be turned over to the government on the absurd charge that the campaign is being orchestrated from Moscow. In their letter, Feinstein and Schiff argue that “public reports” indicate that the #ReleaseTheMemo campaign is being promoted by “social media accounts linked to Russian influence operations.” This claim is based entirely on one source: a supposed social media monitoring service called “Hamilton 68” operated by the German Marshall Fund’s Alliance for Securing Democracy. The Democratic lawmakers argue that “this latest example of Russian interference is in keeping with Moscow’s concerted, covert, and continuing campaign to manipulate American public opinion and erode trust in our law enforcement and intelligence institutions,” and demand that Facebook and Twitter take action. The letter by Feinstein and Schiff is the latest move in an effort by Congressional Democrats, working with the US intelligence agencies, to criminalize the freedom of expression in the name of suppressing “extremist content” aimed at “polarizing” American politics. The major social media companies have been fully complicit in this drive, turning over lists of accounts to the congressional witch-hunters and working to block the propagation of dissenting opinion on social media. The World Socialist Web Site is working to fight this drive toward dictatorship. We urge readers to watch our webinar, “Organizing Resistance to Internet Censorship,” read the open letter from the WSWS International Editorial Board, “For an international coalition to fight Internet censorship,” and contact us to take up this fight.